Few weeks ago, I featured some amazing hand lettering projects from various designers and typographers around the world. And this time, I’ll be adding another awesome project in that list to give you the creative inspiration you need. Leandro Senna, a graphic designer from New York had a very interesting personal project for a month featuring his wide knowledge and artistic skill in typography design. His goal is to make something handmade, out of the computer and getting back to basics. The whole concept of the project was based on the official video of Bob Dylan‘s “Subterranean Homesick Blues” originally released in 1965 where Bob flips huge cards containing significant words from the song lyrics as the music progresses. Leandro’s take on the concept was to do the same interchanging cards but now with the full words of the lyrics in each card featuring a unique hand lettering. After a month, he created 66 cards every spare time as possible using only pencil, black pens and brushes. After everything was done, he created a sharp stop motion video with the cards featuring his amazing hand lettering styles. 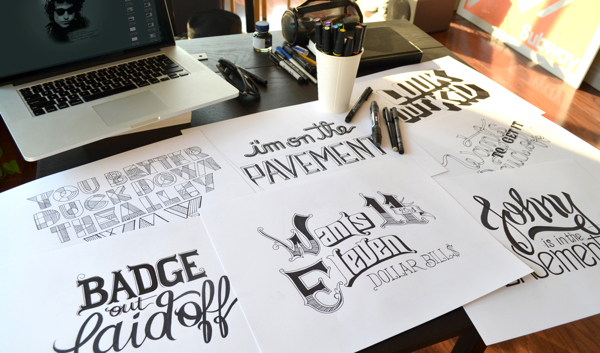 Check out more of the hand lettering designs of this amazing project at Leandro Senna’s official website. Got inspired? Feel free to tell us your thoughts by commenting below. Find us on Facebook, Twitter and Google Plus for more updates. Don’t forget to subscribe to our blog for everyday design news and content.